I’m not sure why Sky as Skin refused to capitalize any letters on this album, but having listened through, I feel like it was an oddly appropriate decision as they put a lot of energy into their second album. 10000 beautiful lakes is filled with high-energy songs that feed on anger and chaos. I’m filled with that badass feeling that accompanies Rage Against the Machine at max volume with the car windows rolled down. It’s grungy, in your face, and it admittedly doesn’t sound like it has anything to do with beautiful lakes. Andrew Bush on drums is my favorite player to listen to. His fills are quick and precise, and the drums come through well. Combined with some neat effects like volume fading, his grooves are fresh and funky. The rest of the band really steps up to the rhythmic plate in “burn the devil down” as they complement the beat with syncopated melodies. The real problem is that the vocals don’t harmonize too well over the mix. Take “verses” for example: The instrument tracks really throw down, but the vocal melody is too dissonant to mesh and ends up sounding out of place. 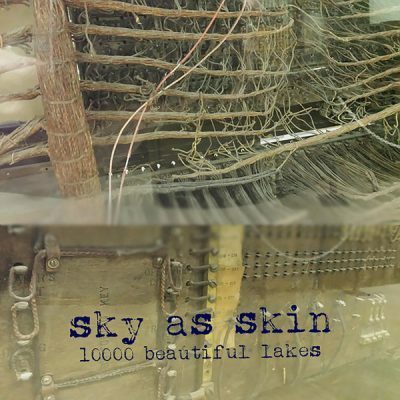 Sky as Skin have some great ideas that I’d like to hear fleshed out more, like the tapping section in “for the damned.” The band seems to enjoy playing quickly, but the album on the whole feels a little slow. The mix is simple—drums, bass, guitar and speech-like vocals that come together nice and heavy, yet are quite predictable. Fortunately, the album experiments with diverse ends of the musical spectrum. From the reggae vibe of “burn the devil down” to the heavy metal “i carry no ghost,” it’s likely that something will catch your attention.